This entry was posted on Tuesday, January 29th, 2013 at 6:26 pm	and is filed under Design, Free Software, Gnome, Planet GNOME, Planet Igalia, Web browsing. You can follow any responses to this entry through the RSS 2.0 feed. Both comments and pings are currently closed. That is a general pattern in GNOME. I can see that working well here: start typing on the overview and open pages are filtered to show only the potential matches. I like it. Chrome for Android has something similar to the Pages button alternative to tabs. I think it’s an awesome idea. I’m a german. So I will start directly! Your warned! Don’t take this personal, especially because I appreciate your work and every improvement to Epiphany. This workflow adds new unneeded actions to change from one page to another. It doesn’t solve problems with many open pages. It will add a more easily usable interface for users on touch-devices. Tabs are the killer-feature of the last decade! The reason why Nautilus and Doplhin/Konqueror are superior over “Explorer” is merely the possibility to use Tabs. Tabs increased usability of every heavy working application, from text-editors, file-browsers, internet-browsers to terminal-emulators. Tabs existed in the 90, too. But especially Microsoft failed with tabs. Even nowadays the typically settings-dialog on windows shows this misuse, they stacked the tabs and reorder them always in a weird way. But that is not our problem. So what is about your design? Don’t remove tabs! Don’t deprecated tabs! Don’t move them to dconf! 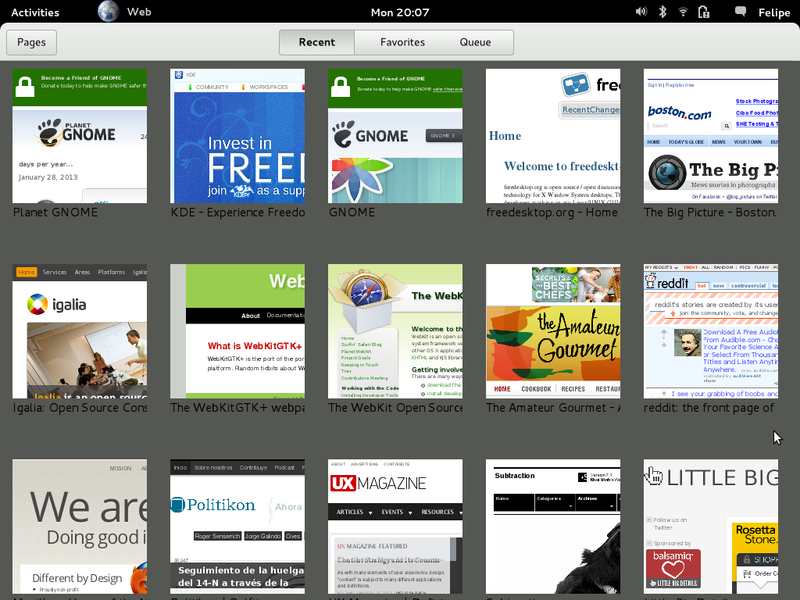 GNOME can’t afford loosing, again, a major feature. There are currently no users on touch-devices. Hard but true, but there are users on laptops and desktops. But this could change and this (new) design has proven to work for Android based devices (similiar on HTC with its own adaption). So and second alternative approach to handle tabs on touch based devices could be a good investment for the future! Add this as a new option and you could win users in the future for Epiphany. Yes add this as OPTION! Don’t deprecated tabs or hide them by default. I can just advise you and the other developers of Epiphany not to make tabs to a second class-citizen*. *Instead Alt+Tab/Shift+Tab should be enabled by default also. Tabs may have been nice in the previous decade but now they are an impediment for better document switching models. Sure, let the keyboard shortcuts exist but the tabs MDI, especially the GtkNotebook implementation, is fundamentally flawed. I am looking forward to the day tabs are removed and replaced by something better. When will you GNOME devs realize that nobody wants to drag the mouse like a maniac? No approach that makes you drag the mouse and click twice as much to perform the same action can be better. No carpal tunnel syndrome after extended use > Context-switching and filling the entire screen with stuff. It should be a sin to translate tablet designs to a desktop. There isn’t one perfect solution, all have to make compromises. Traditional tabs make a lot of compromises: they are small, only show a little amount of text, don’t scale well, etc. This proposal improves legibility, offers bigger targets for touch use, shows a thumbnail for each page, and scales better. It does have drawbacks, true, and you should not mistake it for a final decision in any way. Tabs, as most desktop Web browsers use them (one single thin line on top), are very cumbersome for power users. If you are like me, and like having a few dozen pages open at any time, I suggest you try the Tree-Style Tabs extension for Firefox. It might change your mind about the need for specific UIs for specific cases, rather than sticking to one suboptimal solution for everything. Forgot something! It would be a nice idea to put thumbnails of the open tabs on a sidebar. Saw this in firefox for android some time ago. That would a mix of usual tabs with your approach! I like the concept, but please don’t replace ‘Bookmarks’ by ‘Favorites’. People often have to visit web pages that are not exactly their favorites but they have to go there anyway. To be honest, doesn’t this belong in the Shell? 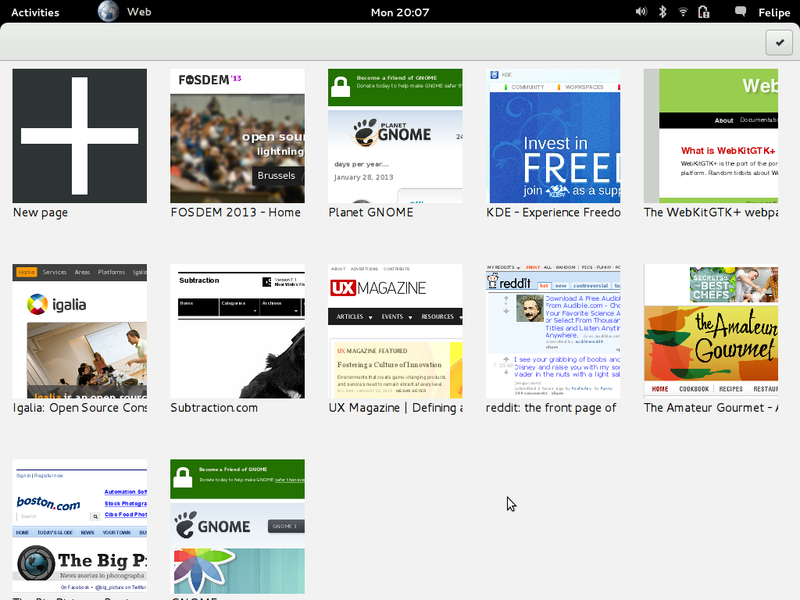 GNOME already supports single-window mode for Web applications. In the general case, a dedicated browsing UI has the potential to leverage a lot more information than the Shell can; e.g. which tabs have been open together, which ones belong to the same domain, which ones have been accessed recently, etc. Some people tend to keep a lot of tabs open and it would not be practical to have all of them in individual windows in the Shell, specially since several of those are meant to be used together for a certain task. Having said that, it would be great if the Shell was aware of open tabs/documents somehow. At least, it would make the overview mode more informative.